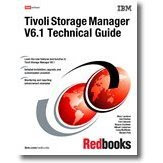 I'm curious to find out your opinion about the TSM v6 published a few years ago. Do you use v6 at all, are you afraid to use it? what about deduplication or simple you are just satisfied with v5? And of course what about the ITM and ISC/AC/TIP whatever this is called? I'm really interested in your view! I use V6 (6.1 and 6.2) and after the initial setup most things are the same. The one headache is the DB change did affect many of my SQL select statements, but I've been able to fix those. My verdict is still out on performance and scaling, but so far so good. I still wish they would dump the ISC and go to something more streamline and functional, but as I say, "Have command-line will admin!" I've submitted my comments on this to the adsm.org link.